New York Mayor Michael Bloomberg and Police Commissioner Ray Kelly both came out swinging in the sympathetic New York media yesterday after four police officers were injured by a violent ex-con in Brooklyn on Sunday. Quoting Kelly, the headline on the cover of the Daily News screamed “I’m tired of this!” But a closer read of the article shows that it is not criminals roaming the street that Kelly is tired of. Rather, it is the fact that citizens in states where Kelly cannot stop and frisk them at gunpoint any time he wants are able to purchase guns as if they were real people. What neither Bloomberg nor Kelly will admit is that the problem isn’t out-of-state guns but in-state criminals and the system that creates those criminals. Crime is a symptom of deeper societal problems that start with poverty and drug abuse, grow into hopelessness, and ultimately result in a parallel society of those who feel they can never be part of mainstream society nor participate in the mainstream economy. Finding themselves in such a situation, these marginalized citizens turn to drugs and sink into the vicious cycle of crime that drug abuse brings with it. But instead of working to eliminate poverty, integrate marginalized citizens into the economy, and reduce drug abuse, the Bloomberg administration has exacerbated the problem by creating a police-state culture in New York with the willing cooperation of Commissioner Kelly. I imagine that many of you feel that the use of the phrase “police-state” is a literary exaggeration. But in this case, I believe the term is completely accurate. The New York Times reports that in 2011, NYPD officers conducted warrantless stop-and-frisk interrogations on over 685,724 New Yorkers, mostly minorities, 88% of which were freed without even a ticket being issued. To put this into perspective, in 2011, the NYPD stopped and frisked, without probable cause, more minority citizens than the entire population of Boston! If that doesn’t rise to the level of a police state, then I cannot image what would. I can only imagine the effect this has upon those subject to such daily disrespect. One of the most poignant articles I have read about how this police-state culture affects those who live under it was a December 17th opinion piece done by Nicholas Peart for the New York Times. Given the toxic environment he has created in the city, we should hardly be surprised that the idea of gun rights is so shocking to Mayor Bloomberg. After all, in his city citizens do not even have the right to walk the streets unmolested. This entry was posted in Abuse of Power, Bloomberg, General Civil Rights, Gun Control, Gun Trafficking, Law Enforcement Misconduct, Media Views on The Second Amendment, New York, State Laws, Trends in Crime. Bookmark the permalink. Not even the East German Stasi was able to personally hassle that large a percentage of their population and they were TRYING TO BE A POLICE STATE. I was last in NYC in 1975 and I don’t miss the city at all. I can find everything I want right here in “free America” (flyoverland). No NYC license or permit required for happiness. Guns aren’t the problem, NYC barbarians are. If we continue to base freedom on the actions of the lowest common denominator we will soon have no freedom at all. Right on the mark, John. To say that those numbers are scary would really be missing the gravity of the matter. It seems that big-city law enforcement (and NYPD is not the only one to blame) has forgotten that policing really only works under the approval of those it serves. Maybe they have the approval of a “scared few” who attend NYPD official functions and think that their tactics are fully appropriate. Community policing – where law enforcement not only respects the community but is a good citizen thereof – is not some convenience. It’s actually a very good system. Officers act rationally on behalf of public order (weird, right? ), and seeing your neighborhood officer cruise by on his regular patrol makes you feel safer, not scared out of your mind. I guess it doesn’t make a good campaign platform, though, in a high-crime area where “tough on crime at any cost” seems like standard practice. 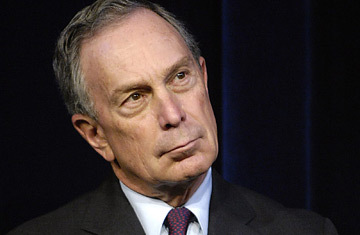 Michael Bloomberg is a strutting little elitist snot who thinks that his is view is the only correct one. He has committed federal felonies by sending his agents across state lines to make straw purchases of handguns in furtherance of his anti-gun agenda. He then tried to have the gun dealers in other states prosecuted for selling the handguns. This is a clear attempt to deny constitutional rights under color of law. (See 18 USC 241 and 242). The commissioner of the NYC police force is simply following the instructions of the mayor, like any good Nazi. The last time that I was in NYC was 1982. I intend to never go there again. I would not visit NYC again for love nor money!! What a toilet! !